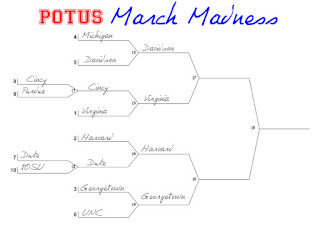 lc blogs: POTUS: march madness: final four. Ever seen a man on fire? Me neither, but metaphorically speaking this team of ragamuffin revolutionaries is on fire. Wilson is coming off of hard-earned victory, but victory is not his to revel in for long. In the end, he falls just points short, breaking the heart of the world. 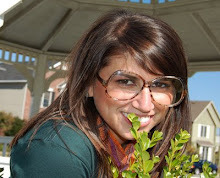 This one could very much be an episode of an after-school special. Clinton and Johnson, the small-timers who grew up with little, versus these other kids who grew up with a lot. Carrying a chip on their massively large, yet reformed shoulders Clinton and Johnson pull ahead early. For a brief moment, it looks like the Ha’va’d Ya’d boys are going to stage a comeback. The comeback is short-lived. Kennedy’s back goes. An injury, his coach later described as a metaphorical “bullet to the head” of his team. JFK’s loss was more of an emotional barrier than anything and things only got worse from there. JQA demoted himself to the JV team, FDR was ruled ineligible after a random rule change in how many years one can actually play basketball and GWB declared victory with a 1-point lead and lots of time left on the clock and even raised a banner to celebrate the victory. 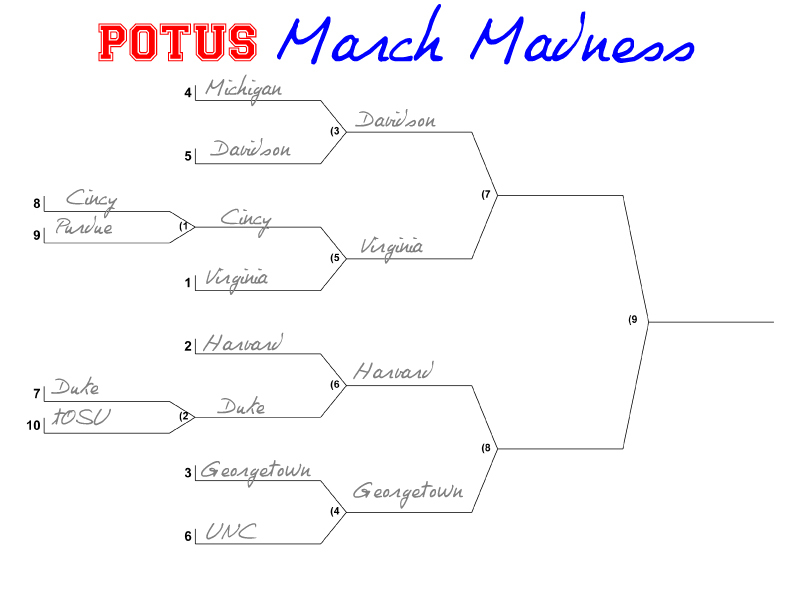 Clinton and LBJ had a few scares, but ultimately pulled ahead for the victory and the chance to play Virginia in the finals. Upset city!